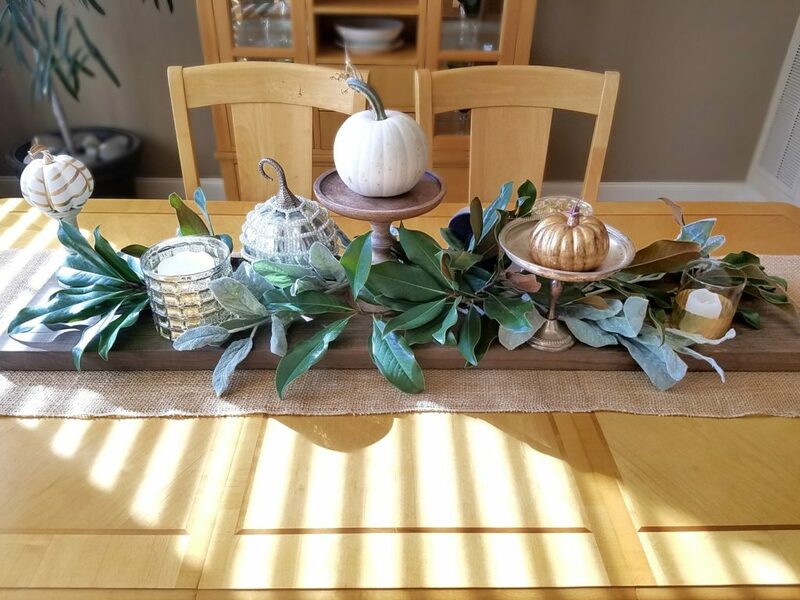 It’s been a pretty crazy work month with lots of travel which hasn’t left me much time for seasonal decorating or posting recipes but I wanted to share my fall decor and a pretty Thanksgiving centerpiece I threw together between trips. As a bonus, I’ve included my go-to recipe for Roasted Brussels Sprouts. This side dish is perfect for Thanksgiving or Christmas and can be made with or without the bacon. Happy Thanksgiving everyone! 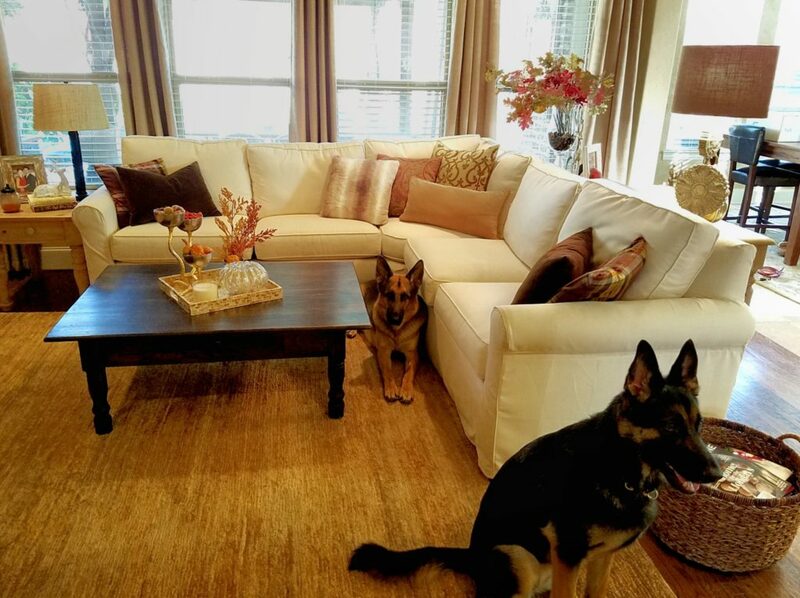 Before I left for my current trip, I had just enough time to take down my Halloween decorations and put up a few fall and Thanksgiving inspired accents. Please forgive the quality of these photographs, I am posting this from my phone, in my hotel room with very little editing! 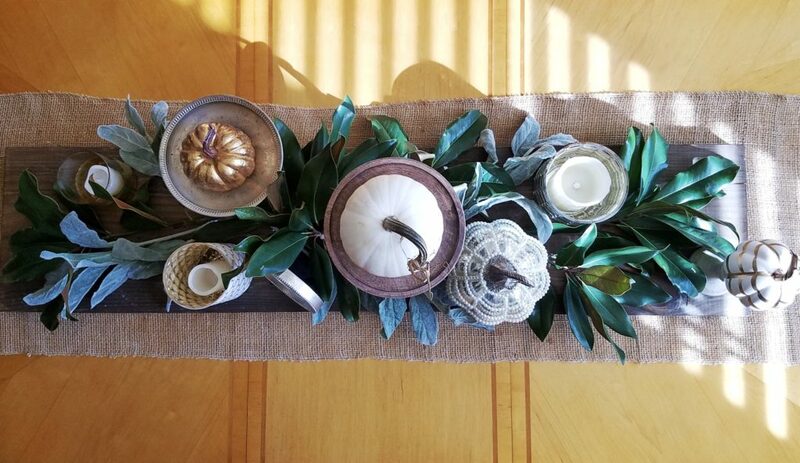 Living in the South where it’s slow to cool down, I have a hard time getting motivated to put up my fall and winter decor. And, honestly, I know it’s the trendy thing to do now but I really can’t get excited about putting up a Christmas tree immediately after the Halloween decorations come down. 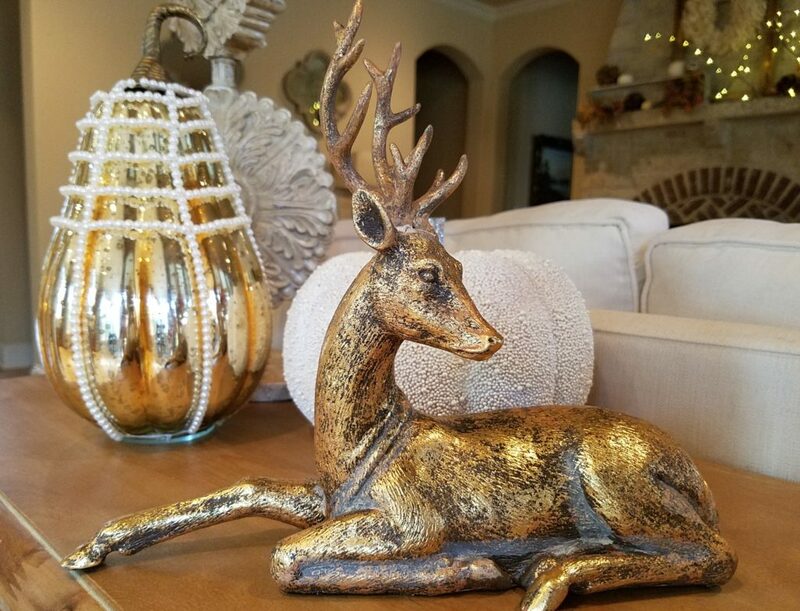 I suppose I might be a little more inclined to pull out the glitter and snow flocked ornaments and faux fur throws if it wasn’t still 85 degrees and sunny outside! My compromise this year was to work a bit of Christmas trimmings into my fall decor. Here I’ve added a few reindeer to the burnished autumn leaves, pumpkins and acorns. 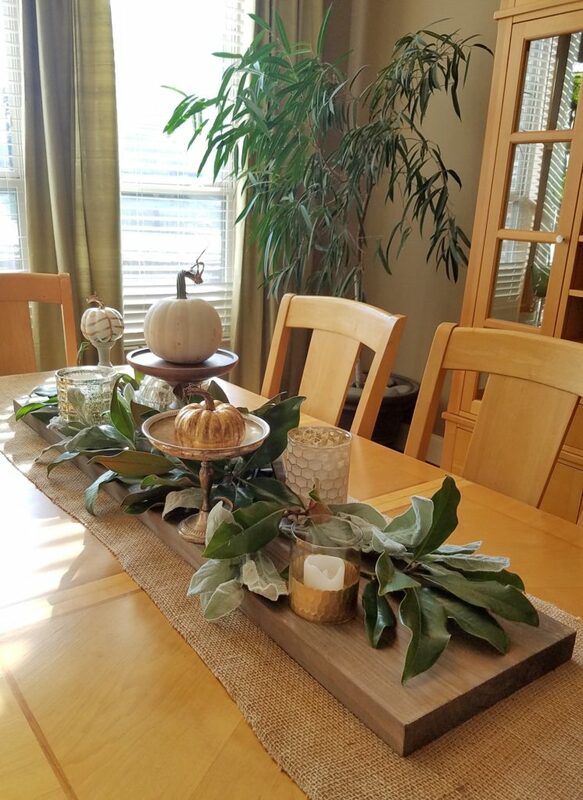 Earlier this month just before I left on a trip I had hurriedly replaced the macabe Halloween centerpiece on our dining room table with a collection of fall accessories in no particular order. Once I returned home, I decided this looked more like a display shelf at an interior design shop rather than a finished centerpiece. This past weekend I finally had a little time to work the pieces I’d set out into a Thanksgiving centerpiece. I didn’t go overboard, just tucked some faux and real branches in amongst the pumpkins and silver and gold votives and I’m pretty happy with the results. 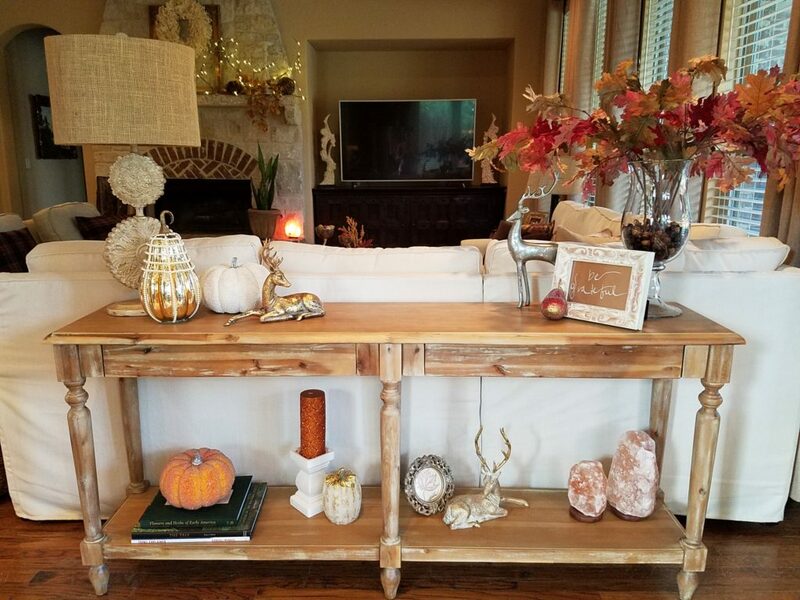 I started with a few odds and ends, like pedestals of varying heights and votives, and spaced them out along the oxidized wood board that normally sits on the table. 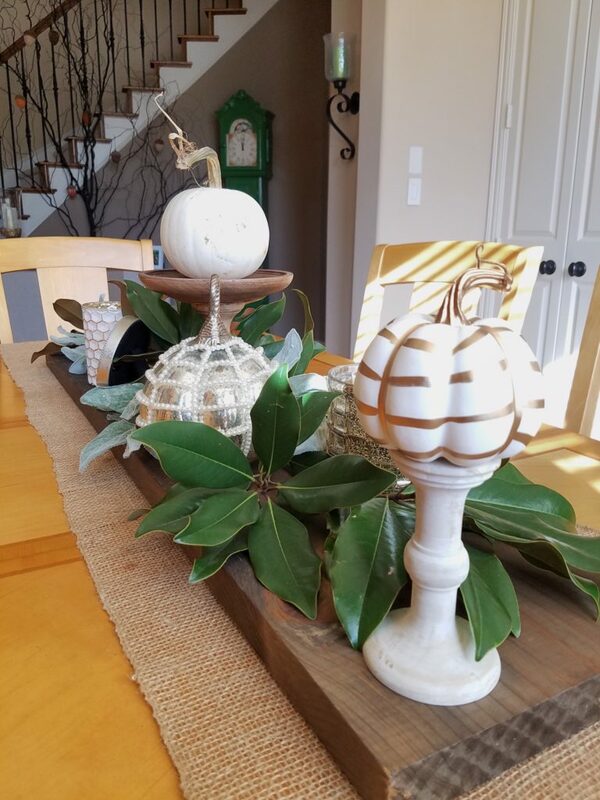 I accented this with white and gold pumpkins left over from my Halloween decor, then tucked in the faux lamb’s ear branches for some subtle color. I didn’t have enough lamb’s ear to fill it out so I snipped a couple of branches from our Magnolia trees to finish it off. I’ve said it before, if you can possibly grow Magnolias in your area, DO IT! 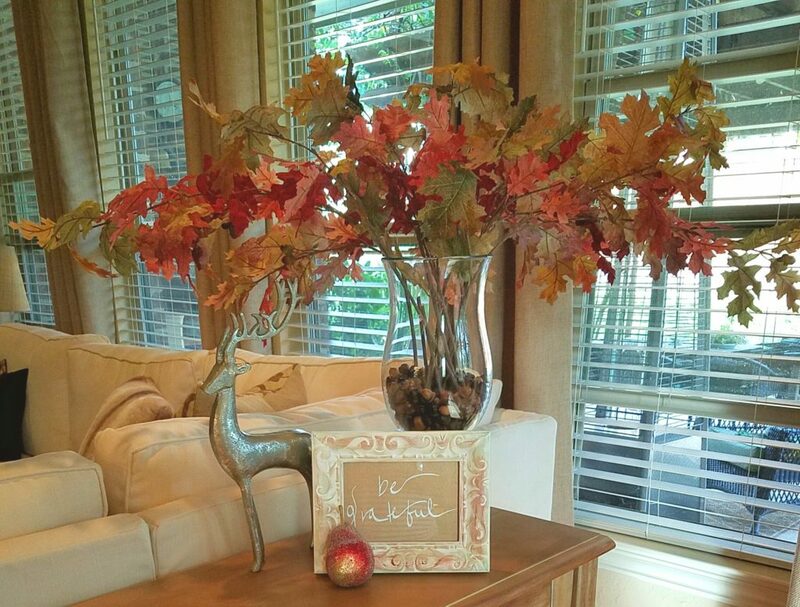 They are hands down one of the simplest and most beautiful decorating accents around. The framed “give thanks” is something I made last year with silvery-grey card stock and a silver metallic paint marker in a cute little frame. Lastly, if you’re feeling cheated because I’m not actually posting a recipe for Thanksgiving, I’ll give you my old-brussels-sprouts-standby. It’s a down and dirty version and alas, no photos as most hotels frown on guests roasting vegetables in their hotel rooms. I’ve been making this dish for years, waaay before brussles sprouts were cool, and I’ve shared the recipe many times as it’s always a hit. It’s a great recipe for Thanksgiving (maybe next year!) or Christmas because you basically toss it all together in one pan and the oven does the rest; leaving you to deal with scalding hot cranberry sauce burns and 20 pound turkey wrestling. I created this dish long before I stopped eating most meats, hence the bacon. If you’re a fan of bacon this is the Brussels Sprouts dish for you. If not, simply replace the bacon fat with coconut oil and skip the rendering step. Roughly chop the bacon and toss it in an oven proof roasting pan with tall sides, I use a glass pyrex. Cook the bacon in the oven until the fat has rendered and the bacon is cooked through. Remove the bacon with a slotted spoon and set aside. * if you’re omitting the bacon, melt the coconut oil in the pan in the oven until hot. Add the halved brussels sprouts to the pan, sprinkle with salt and pepper and toss well to coat with the hot oil. Return the pan to the oven and roast about 20 to 25 minutes, stiring half way through. When the brussels sprouts start to turn brown, remove the pan from the oven, toss in the chopped apple and stir thoroughly. Return the pan to the oven for 10 minutes more or until the brussels sprouts are crispy on all sides. Top with grated Parmesan cheese if using. I’m with you! It is way warmer than usual here but even it it was cold I still don’t want to rush to Christmas decorations. I love the fall ones too much I guess. I will show Andy this recipe, they are bringing brussel sprouts tomorrow. I love the way you use fresh leaves and other things from nature juxtaposed with man made objects d’art to create lovely decor! 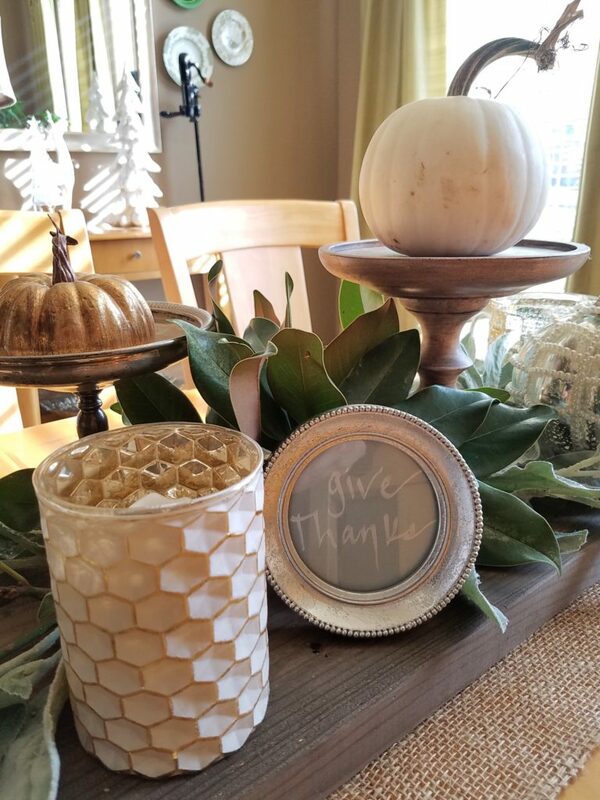 I like your “give thanks” and “be thankful” notes on decorative items; ie, a framed square, and a plate. Did you create these items yourself or were they purchased?